Lipsticks and Lashes: The Winter Bloggers Snail Mail - Sign Ups Now Open! 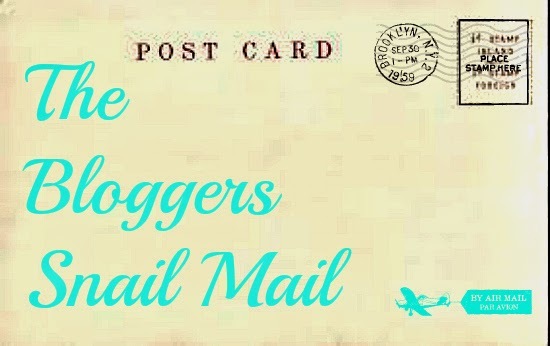 The Winter Bloggers Snail Mail - Sign Ups Now Open! Welcome to the Winter round of The Bloggers Snail Mail! Way back at the beginning of March I launched the first ‘The Bloggers Snail Mail’ and this is now going to be the fourth round!! Ive had so much fun organising this project and chatting to lots of new lovely bloggers, I really hope you get as much out of it as I do. So to sign up for the ‘The Bloggers Snail Mail’ you just need to send an email to whatsinyourmakeupbag@gmail.com, title it ‘The Bloggers Snail Mail’ and include in it your name, where you are from, and you blog! Sign ups will be open until the Friday 28th November. I will then randomly match you all up aiming to make sure you are with someone from another country or at least in another area from you! I will then let you know by Monday 1st December who your partner is and you then have 4 weeks to get to know them! So the week of the 29th December, you can then send your new buddy their Snail Mail! I love this idea so much! I have emailed my info to you! What an absolutely lovely idea! Such a wonderful way to connect with people, I am definitely going to sign up to this! Really great idea! How many have you got signed up for the December swap? There is around 30 so far but sign up is still open till Friday so im expecting a few more! so excited for this, can't even wait until tomorrow!!! what a lovely idea, so sad i just missed out on this. I would have loved to have participated. I am going to participate in march.